In a huge beta update, Amazon recently released extensive new targeting options for Sponsored Products. Here’s what’s new and what it means for you. Update: It seems that Amazon has released the new feature to the public — everyone should be able to try it out now. Watch out for our experimental post, where we test all areas of this new targeting tool. Stay up to date — Subscribe to our newsletter. Advertisers can now target categories and products with Sponsored Product ads. Until recently, Amazon decided which Sponsored Products occupy the prime real estate position on product pages. Now advertisers can fine-tune their settings to target ASINs, brands, and categories. With this new manual targeting feature, the shopper sees an advert relevant to the category rather than the search term. For example, a shopper searching for “jogging shoes for girls” will see adverts targeted to the category “Women’s Fashion: Shoes: Athletic”. 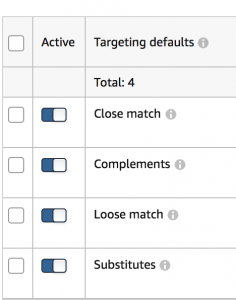 The update also includes new options to differentiate and refine automatic campaigns. The New Targeting Features for Sponsored Product Ads — What’s New? Similar to Product Display Ads, you can target customers by product — from generic category to specific ASIN. 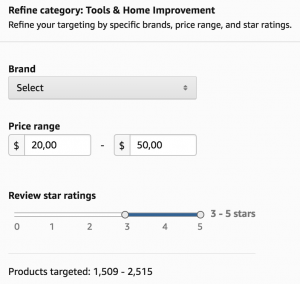 Refine your target even more by focussing on a price range, brand name, and star rating. Negative List: The new option to exclude products and brands from a manual targeting campaign is a congruent addition to this feature update. Extended Reporting: The “Keyword Report” is now called “Targeting Report”. Like before, it provides insights into the performance of your keywords. The report now also includes data from targeted categories and products. Such a cross-factor analysis can help you identify the most successful targeting segment. Once you know what’s working, you can shift your advertising budget towards it (and lower your ACoS). d) product pages that are similar to your product (e.g. a competitor’s phone). Which targeting method will perform the best for you? It’s a good idea to start playing with these new options — they will, in all likelihood, shape your future strategies. How Does This Update Influence My Marketing Strategy? The familiar keyword-based targeting is still in place and stays the same. The new functions, however, now allow some additional strategic decisions. Keyword-free targeting: Target brands, categories, and products easily and comprehensively without researching a long list of keywords. Product discovery: Increase brand awareness and lead shoppers of similar products to your page by targeting related categories. Target yourself: Want to make sure shoppers stick to your stuff? Bid heavily on your product. Refine your ads to target your product and category — and push competitors off your page. Add value to the basket: Use the target-yourself-strategy to promote your complementary products. Given the right incentive, a shopper buying your phone might also add your protective case to the basket. Think simple: Batteries included? They are now. Cozy up to the competition: Inversely, place your ads with selected competitive brands and products to offer shoppers an enticing alternative: your product. For maximum effect, fine-tune your competitive targeting to ASIN-level or, for example, a similar price range and 4-5 star reviews. Streamline your automatic campaigns: Refine your automatic targeting by identifying the combination of the search term and product page targeting that perform the best. The new targeting feature for Sponsored Products could be a profitable addition to your advertising strategy. It is still in beta, so be cautious when you test it. We recommend exploring the new mechanisms and their performance before dedicating large budgets. This release also concludes a noticeable trend: Amazon has now unified all advertising possibilities for vendors and sellers. First Sponsored Brands (aka Headline Search Ads) became available for sellers, now product targeting has arrived, a feature comparable to Product Display Ads. Vendors should prepare for stiff competition: Sponsored Products and PDA display on the same page. Questions we asked ourselves: How well will these types of targeting campaigns perform? What will change before the public release? Will CPC rise to the moon because of fiercer competition? Will Vendors have to use more PDA in future to keep up with the increasing number of Sellers encroaching on their territory? We’ll fire up our test lab and keep you posted with satisfying answers and juicy updates about product targeting for Sponsored Products — Expect an integration of these exciting new features in Sellics Seller Edition and Vendor Edition very soon! What do you think? How will you use the new update? Have you tried it yet, and what were your results? Amazon vs. eBay: Where should you sell your products? Content Marketing Manager at Sellics. ​I stay on top of Amazon News to bring you the freshest updates and business strategies. Keep reading and commenting -- We love to hear from you!